Have you ever attended a traditional Vietnamese wedding? It’s an interesting experience as it reflects distinct features of our culture. Through the event, you can learn a lot about our country’s routines and practices. 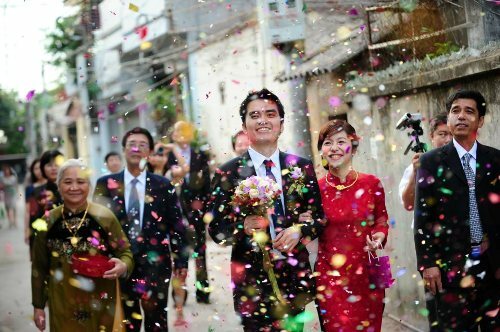 If you want to know about, or hold your wedding in Vietnamese style - especially when you or your partner is Vietnamese - you’ll find in this article a lot of useful information. In eastern culture, we consider marriage a major event in our life. Thus, we highly value wedding ceremony, even more important than the marriage certificate. After wedding ceremony, the couple has already become spouses in eyes of their families, relatives, neighbors, colleagues, and friends. In some cases, they can complete marriage registration long after their traditional wedding. The wedding ceremony has different procedures and rituals in different regions of Vietnam. In this article, I’ll talk about non-religious traditional Vietnamese wedding in the northern part, or more specifically, in my Haiphong City area. I think it’s pretty same as in Hanoi capital. In practice, you will probably find out certain differences compared to weddings in other places of Vietnam. Having gotten to know and understand each other, if a couple is serious about their emotional relationship, the boy will ask his parent to visit the girl’s house, for the first time in many cases. The meeting is usually in the evening. The boy’s family brings traditional offerings, which are simply betel and areca (trầu cau). In our tradition, when people mention "matter of betel and areca" (chuyện trầu cau) they are talking about marriage issue. On this occasion, parents of both sides meet to know each other and approve the relationship between the two children. The two families also officially allow the couple to have more time to thoroughly understand each other. After certain duration, ex., several months, the couple will decide whether to proceed to a marriage or not. Dates: Bridegroom’s family will actively choose the auspicious dates for proposal and wedding and discuss with the partner to fix the schedule. These dates must be based on the lunar calendar, and usually there’re only such a few good dates a month. This is very carefully selected, as Vietnamese believe well-selected wedding date will bring luck and happiness to the couple in their later family life. Plan: the ceremonies should be carefully prepared, because in our belief, marriage is one of three most important things in our lives: buying buffalo (denoting career), getting marriage, and building a house. On the chosen good date, the prospective groom’s family together with closed friends and relatives bring proposal offerings to the future bride’s family. 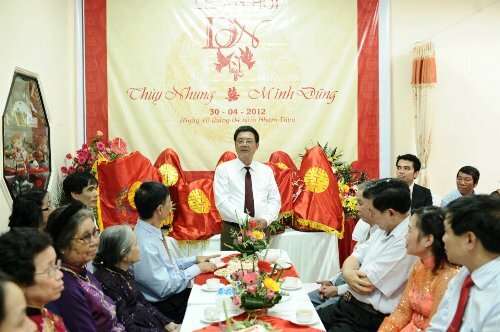 At this occasion, the representatives of both families (usually old people) meet and talk with one another as a way to establish an official relationship between the two families. 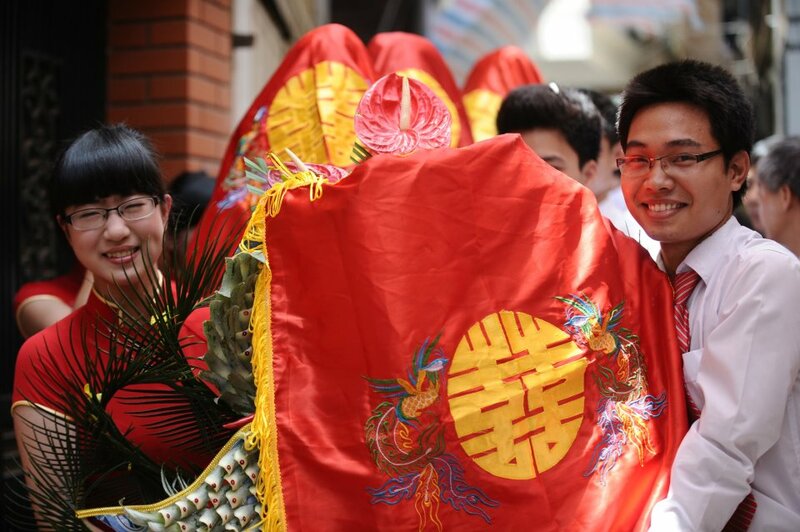 Young people including friends of the couple also attend to congratulate the happy ceremony. Betrothal gifts are placed in trays or round lacquered boxes, covered with a piece of bright red cloth. The number of trays must be in odd number such as 5, 7, 9, 11 (deemed lucky number), as requested earlier by the girl’s family. Each tray has one or a few relating traditional presents in the following list. The first two is a must. Each gift tray is brought by one unmarried young boy. The future bride’s family also sends the same number of unmarried girls to receive the gifts. The delegate can go by rented bus (all in one bus), or by taxi (each on one car), or by cyclo (xích lô). They should stop about 100 meters away from the girl’s house to re-arrange all walk in procession into her house. The fiancee has to stay in her (or a separate close) room waiting for her parents’ permission allowing her fiance to come in and take her out. The fiancé’s family officially offers the proposal gifts and ask to marry the girl for the boy. Once the girl’s family accepts the marriage offering, they’ve agreed the wedding, and thus cannot receive the offer from any other family. In the ceremony, part of the gift will be solemnly placed on the ancestor’s altar. The young couple lights incense sticks and prays at the altar for a moment. Then fiance gives engaged ring to his prospective wife. The new bride brings tea pot to greet and invite all family members and guests. Meanwhile, the two families also sit discussing and fixing the date of wedding. After proposal date, the girl has become not-yet-married wife of her fiance. Then, it’s time for both parties to invite guests to the wedding. The girl’s family usually gives wedding invitations together with some above-mentioned offerings (i.e. bánh nướng, mứt sen, bánh cốm). Invitations should be sent out about 3-10 days before the wedding date. The inviters should go in person to each guest’s place. Guests include relatives, friends, colleagues, neighbors, etc. The total number of guests depends on the families’ relationship network, and is usually around a few hundred. Asking the bride to bring her to the groom’s house (lễ xin dâu). The groom’s family send elder and respected representatives to the bride’s home to notify that groom family is on they way to pick up the groom. It’s about half an hour before the later part. Bringing the bride home (lễ đón dâu). Groom family goes to pick up bride on a car decorated with flowers (xe hoa). The groom’s family arrives. The groom asks her parents in law for permission to bring his wife home. Then, he enters her room to accompany her out. Together they light up incense at her family’s altar to pay tribute to ancestors. Once stepping on the flower car to groom’s house, from the customary perspective, she’s officially left behind her single life. She will follow her husband to his home. The delegation goes to groom’s house have several beloved members of the bride, including her best friend. There, the bridegroom again light incense at the altar of ancestors. In reality, two families can jointly or separately hold the wedding party. On that day, the bridegroom wears formally attire, often in western style. The groom wears veston, and the bride is in long dress with gown, glove, and flowers. The event is held in a wedding hall or sometimes at their house (if it’s large enough). It usually starts at the end of morning (11:00 am) or afternoon (17:00 pm), and lasts about a couple of hours. The ceremony will enjoy foods while listening to traditional Vietnamese wedding songs performed by local singers or volunteering guests. Guests should bring wedding gift, which is normally cash put in an envelope. Sometimes, closest friends may want to give tangible presents like electronic rice cook, pottery, pillow and bed sheet, etc. After wedding ceremony has finished, the couple and family go home. Unlike before, now more and more couples go honeymoon after the event. Three days after the wedding, the new husband and wife brings a chicken couple (male and female) to his parents-in-law as a thank-you gift. 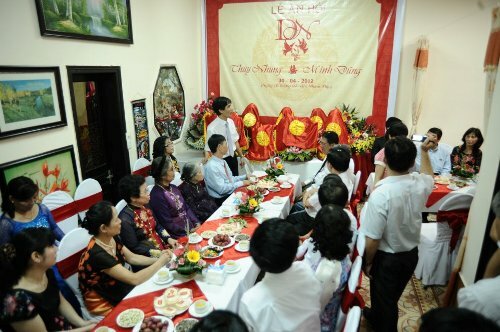 At the following Vietnamese New Year, the new couple is expected to visit to introduce their new spouse to closed relatives of both families. This customs is especially necessary if they are living in countryside villages. According to our tradition, the good year that both families hold the wedding must take into account the age of the prospective bride. Usually, a girl will not get married when her lunar age’s ending number is 1, 3, 6, and 8 so as to avoid bad luck for her later marriage life. Then she has to wait for another year. In some rare cases, a girl in “ugly” age still insists on holding wedding, her family has to perform many other rituals to help her overcome bad luck for later marriage life. I don’t know if that’s true, but simply, it’s a belief. When preparing and decorating a beautiful happy room for the new couple the bridegroom’s mother or another elderly woman spreads out a new mat on the wedding bed to wish happiness to the couple. The woman performing this important rite needs to have many children (both male and female) and grandchildren, kind-hearted, and indulgent. In Vietnam, a girl usually lives with her family until her marriage. 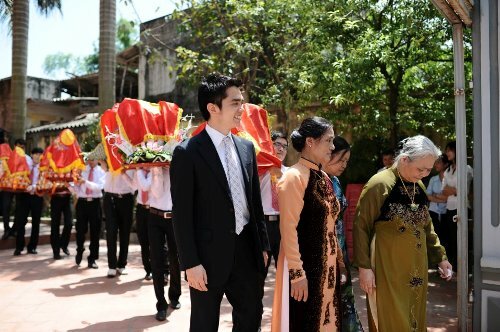 In “đón dâu” ceremony, a bride has to say goodbye to her parents and neighbors and leave her home to live in another family. It’s an emotional moment of a big change in life, and brides often burst in to tears. So do their parents. In a traditional Vietnamese wedding, it is the bride’s father who will accompany her to the bridegroom’s house. Her mother must not go. It’s is to say Vietnamese weddings now have been simplified, but still retain their traditional features, celebrating the most important event of a person’s life. Having read that, how do you think about traditional Vietnamese wedding? Do you think it’s interesting? How’s about weddings in your country? Share some of your thoughts here. We’d love to hear from you! Finally, if you find useful information in this article, would you mind encouraging me with a Like button? I love your thumbs up. Thank you very much! P.S. : All photos in this article are courtesy of Minh Dũng and Thùy Nhung. Thank you Dũng & Nhung for your permission to use your wedding's beautiful pictures on this page!